More info coming soon... Three of the six models are pictured here. is the A.I/the computers actually going to be good or just spin out the whole time cuz it would be nice to actually race against the computers a little. Lol, typical skusa being a smartA$$! do you see 3 different cars in that picture? 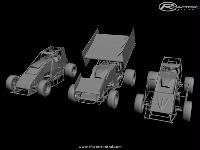 Any new progress, are there going to be different chassis i.e. J&J, Maxim ?